We listened when our investors told us that they wanted higher returns for taking on greater risks. In fact, we will raise the expected return on our highest risk loan product by 12.3% over the coming weeks. That means you will be receiving returns of up to 32.5%, if you can live with the higher risks. Previously this product had a very healthy 20.2% expected return (ER). 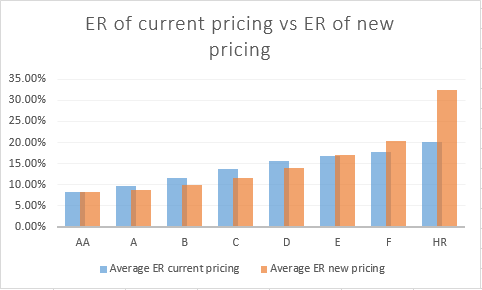 Now it will offer a potential ER of up to 32.5%. The aim of this change is to increase the rewards for those investors who buy higher risk loans. You can see expected return rates according to the new loan pricing structure compared to the old pricing across all the risk categories from the charts below. As you can see we will be slightly decreasing the expected returns on the lower risk segments (AA,A,B,C) but really ratchet up the potential payout from our high-risk HR product. That means all of the new loan buyers will get a higher return with the new pricing. To achieve this we will update our entire pricing by changing almost everything related to setting interest rates including how we calculate scheduled cash flows, default curves, prepayment curves and recovery rates to arrive at the interest rate. We at Bondora are always working to provide our investors with the highest return possible. The new loan pricing structure is only the latest of our efforts to maximize returns for our customers. Please make sure you read all the information provided carefully before making a decision to purchase. Even though the returns are better, the risks are still the same.